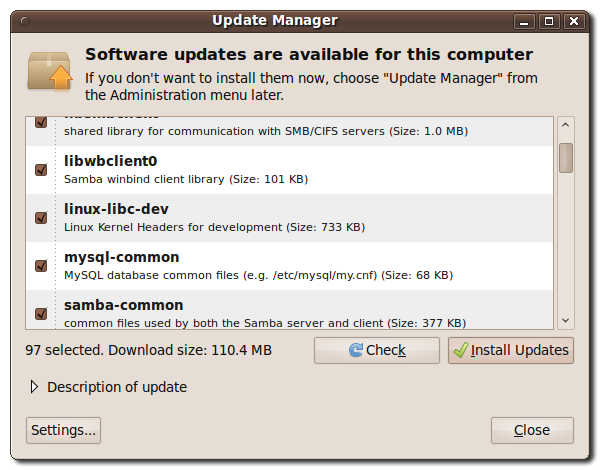 Ubuntu’s Update Manager is a great utility that keeps all of your software up-to-date. If you’re using the default sources, updates have been tested and should work with no problems. However, one item that you may not want to upgrade is the Linux kernel that powers your computer. Maybe you’ve customized your kernel, are annoyed with constantly cleaning up your Grub boot menu, or have had issues with video and audio drivers not working after kernel updates. 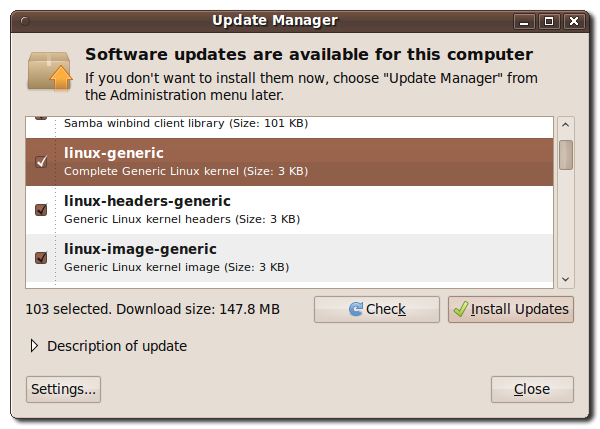 The following steps will show you how to hide kernel upgrades in Ubuntu while still allowing you to use Update Manager to get other software updates. 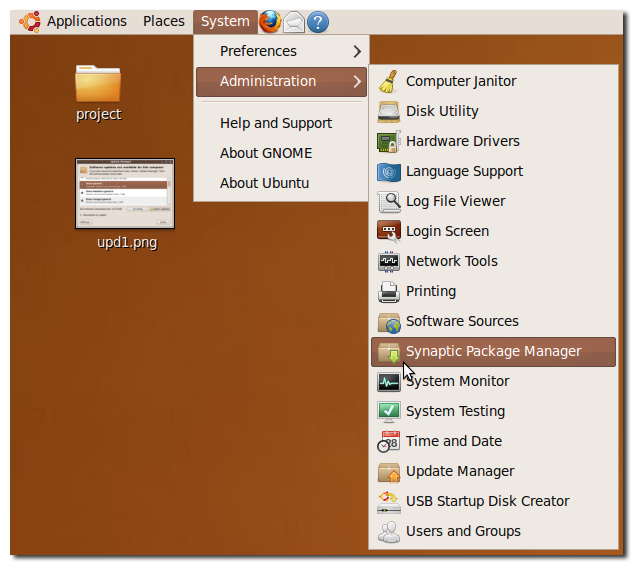 APT (Advanced Packaging Tool) is the system that Ubuntu uses to manage all of the software installed on a system. It allows you to “pin” a package to a certain version, so that it won’t be updated when you the Update Manager runs. To pin your kernel packages, first you must determine what version your kernel is. 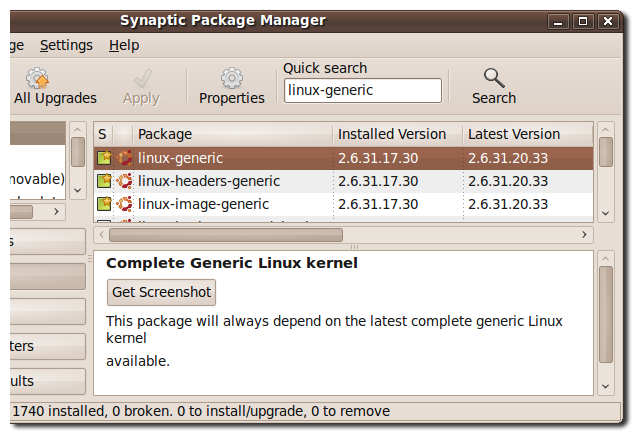 One way to do this is to open the Synaptic Package Manager in System > Administration. Type in “linux-generic” in the Quick search text field and hit enter. Make a note of the number listed in the “Installed Version” column. We’ll use it in the next step. This will open up a gedit window. Most likely the window will be blank, unless you’ve played around with APT before. In the window, type in the following, replacing the version number with the version number you found in the Synaptic Package Manager. Save the file and close gedit. If you open the Update Manager, you should see that the Linux kernel updates are now hidden! Note: Make sure that you update your kernel every now and then, as even Linux suffers security issues occasionally.